Not so long ago, Ron and I took a trip to the place where I grew up: an inner suburb near the city of Sydney. How it has changed! Gone are so many little old houses: many the cherished homes of friends and family. In their place: towering apartment blocks. Gone, too, is our old home: its glorious stone and wrought iron fence replaced by soulless cement blocks. But at least the public parks remain. Long ago, I’d spent many happy hours playing within their green oases. Today, we stroll around, and I share with my husband little anecdotes of childhood. My burning memories are more of tar and cement, since even my own backyard was sparse of vegetation underfoot. 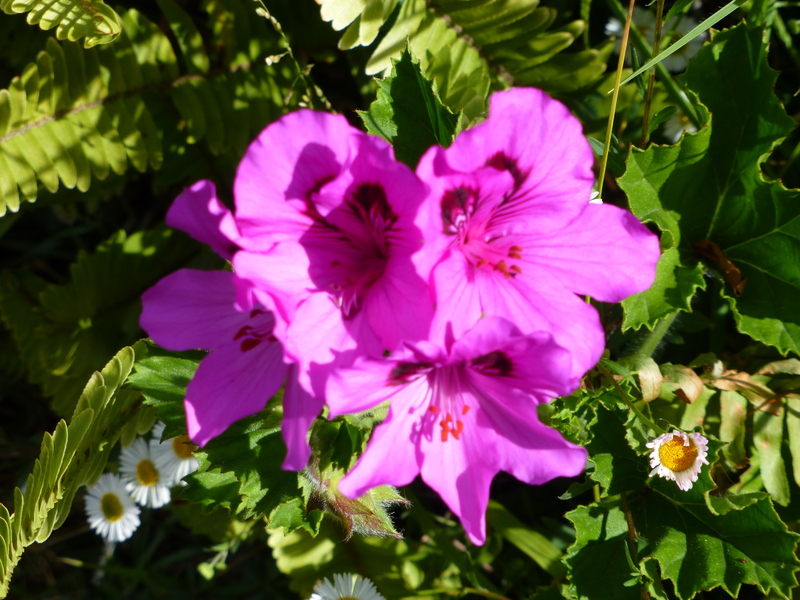 Yet, even so, I remember so vividly the purple pelargoniums that soldiered on doggedly in our front garden. Despite stubborn weeds and equally stubborn grasses, they gave of themselves, creating cheer. Was it just a stroke of luck that my family brought cuttings of these vivid yet hardy gems to our new address, when, in the 1960’s we moved away? In any event, these same plants: or is it their descendants? : are still soldiering on, here at home: a living reminder of from whence I came.